The ISS (International Space Station) has been crossing our northern latitudes in daylight for the past few weeks, but it is now becoming visible again before dawn. Its first decent transit for London peaks at 03:58 BST on Saturday, 20 July, albeit at only 13° in the SE. It may not quite rival the conspicuous planet Jupiter which is low in the NE and close to Mars at the time, but the ISS climbs higher with each morning and will soon be making spectacular passes directly over S England. Rather than publish predictions here, I encourage you to visit www.heavens-above.com where you can obtain predictions and charts for every transit, customised for your exact location. The site also provides predictions for other satellites, which helps us identify any satellite seen accidentally – and there are plenty of those during our summer nights. Note, though, that other websites and also smartphone and tablet apps provide similar information. If you check your predictions for the ISS you will notice that their times are repeating every two days, so that there are further transits for London that culminate at 03:58 on Monday (reaching 26°), Wednesday (47°) and Friday (75°). This occurs because the ISS is currently making almost exactly 15.5 orbits of the Earth every 24 hours, so that it completes 31 orbits in 48 hours. 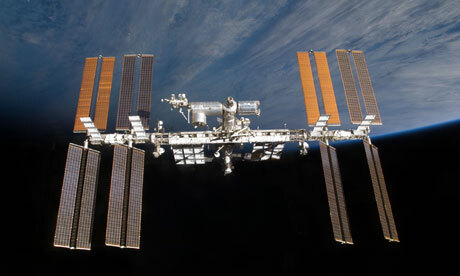 Morning transits of the ISS continue for London until 5 August, with evening transits beginning on 4 August and continuing until about 25 August.